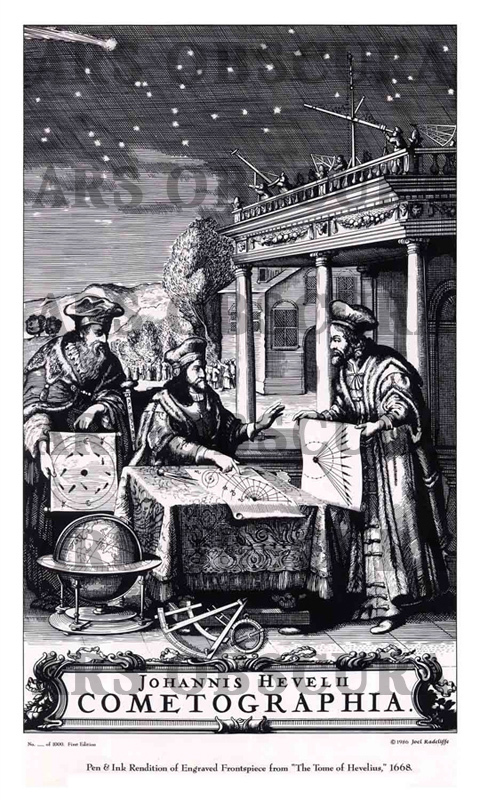 Cometographia (Art Prints/Posters) « Ars Obscura Bookbinding & Restoration Co.
Re-created for the return of Halley’s Comet in 1986, this print is an exquisitely rich reproduction of an engraving from the history of Astronomical Science. Johannes Hevelius was an astronomer from Danzig, Germany. The print depicts three allegorical figures showing the Aristotelian idea that comets are sub-lunar (left), the Keplerian notion that comets move in a straight line (right), and the idea of Hevelius (center) that comets originate in the atmosphere of Jupiter or Saturn and move about the Sun on a curved trajectory. This print is printed on a laid–stock imported from Holland, Nideggen, epitomizing the visual texture of antiquity and with a deckled edge. This edition is limited to 1000 copies, signed and numbered by the artist, Joel Radcliffe. The dimensions are 38 inches by 25 inches. Suitable for framing. We offer a one-stop full service traditional bookbindery, restoration, custom binding, archival box & publication shop. Phone: (206) 340-8810 // Address: 214 First Ave. S. #B-11, Seattle, WA. 98104 USA.